Winter is coming and for many that means their skin can become more dry and irritated. While daily cleansing is a vital step in any skincare regimen to maintain clean, beautiful skin, many cleansers can strip the skin of its natural moisture – making skin issues worse in the cold winter months! Treat skin to a luxurious, gentle and moisturizing cleansing experience with Appriya’s Mineral Cleansing Mousse. Formulated with Appriya water, this powerful mineral water is the secret found within every Appriya product. Pure and untouched, Appriya water flows across ancient marble, where it is naturally enriched with a delicate blend of silica and hydrogen peroxide. These two ingredients help keep collagen and elastin fibers flexible and strong, while working to regulate oxygen levels and reduce inflammation. 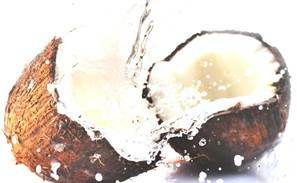 The coconut extract which is high in fatty acids are native to human skin, so instead of simply preventing water loss, coconut extract can actually help replace the skin’s lost lipids (natural oils/fatty acids). In addition to making skin softer and more pliable, coconut extract is also a natural antibacterial, so it will keep infections from forming in the cracks of dry skin. Let your skin drink it up!